You typically set a tooltip as a simple textual label, setting the value of the Tooltip property for a control to a text string. You can also define a more complex tooltip that includes several controls. 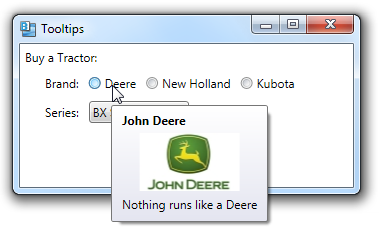 In the example below, hovering over one of the tractor brands causes a tooltip to be displayed that shows the logo for the brand. A tooltip is actually a popup window represented by an instance of the Tooltip control. Because it inherits from ContentControl, its content can be any .NET object. You can specify a tooltip’s content in XAML as a child element of the parent control. The content must be a single element, but can be a container that in turn contains other elements.